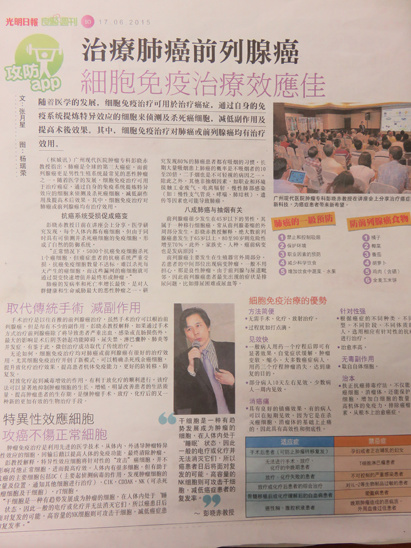 On June 17th, Guang Ming Daily published a special report on the effectiveness of natural therapy to lung cancer and prostate cancer treatment. Professor Peng Xiaochi, oncologist from Modern Cancer Hospital Guangzhou, indicated that currently lung cancer was the third major cancer in the world, and prostate cancer was the most common malignant cancer in male reproductive system. The continuous development of medicine brings a new hope to patients--natural therapy is available for cancer treatment. This therapy reduces side effects and improves the postoperative effect by improving one’s own immune system to extract specialized cells to detect and kill cancer cells. Biological natural therapy is effective in treating lung cancer and prostate cancer. Biological natural therapy creates a new pattern, which kills residual cancer cells precisely; improves the efficacy of radiotherapy and chemotherapy; reduces the toxic side effect of radiotherapy and chemotherapy; and contributes to the smooth running of radiotherapy and chemotherapy. Meanwhile, it improves patients’ immunity and living quality, and prevents the recurrence and metastasis of cancer. Moreover, natural therapy is a new effective biological treatment after operation, radiotherapy and chemotherapy, which suppresses the cancer cells’ growth and proliferation and prolong patients’ lifetime. Taking advantages of the advanced medical technology, biological natural therapy induces cancer-specific effect cells in vitro and in vivo. Then transfuses back cells to improve human immune function and finally destroy the cancer. Professor Peng interpreted that the specific effector cells will kill the cancer cells without affecting other normal cells, thus to improve the efficacy. The main anti-cancer cells in human body are DC (DC cells are used to detect virus, orientate the number and position of cancer cells, and inform other cells for treatment ),CIK·CD3AK,NK (kill cancer cells and stem cells) and rT cells. The advantages of natural therapy include simplicity of operator, quick effect, pain reducing, highly targeted, no toxicity and side effects, etc. This therapy is suitable for patients who cannot receive operation, radiotherapy and chemotherapy, or those undergo radiotherapy and chemotherapy failure. Attention should be paid that this therapy cannot be adopted by the following patients: pregnant and breast-feeding women, AIDS patients, patients with severe infection, allergy sufferers of biological products, like IL-2, and so on.